Sorry for my lack of blogging the last few days! My family is visiting so we've been busy busy around these parts! I promise there are some good Thanksgiving recipes coming over the next few days! For tonight, however, I wanted to do a product review of one of my favorite cooking tools! It is a program for your computer called MasterCook 9.0 that has some really awesome features to help you with shopping and cooking! A few years ago my friend Val brought this program to a church recipe night and totally sold me on it! I think I got ended up buying it as a birthday present for myself! It was around $20 dollars at Best Buy back then but I just looked it up on Amazon and it says $8 dollars...so that is quite a deal if you are looking for a great Christmas present for someone (or yourself!). First of all, it contains hundreds or recipes for you to try...each including the serving size, nutritional information and shopping lists! It also allows you to enter your recipes into an easy to use spreadsheet and create your own recipe books. (Printing and emailing options are even available if you want to give your recipes to someone else). Another great feature is the pantry option. This is awesome for food storage! You can enter all of the contents of your food storage and as you make different recipes it can subtract what pantry items you used and help you to stay on top of what you need to buy each week at the store! You can also pick your recipes for the week and generate shopping lists for you pantry! And the BEST feature is the "What can I make" button. Once you've added all your pantry contents and recipes, you can click the button and it will search through all of your recipes (and the included recipe books) and tell you what you can make with just the ingredients you already have! I love it! With little kids, I don't always get to the store on the day I planned so it is great to find out what recipes I already have on hand. I mean hopefully I'm not alone here, but I can totally look into a full pantry and think to myself "I don't have anything to make for dinner!" This one little button proves me wrong time and time again! Plus when you plan menus around what you already have it really saves money! Well, those are the features I use the most but there are plenty more! It's an awesome program and $8 dollars is an awesome price! There is also a newer version available for $19.99 (which is probably why the older version is only $8). 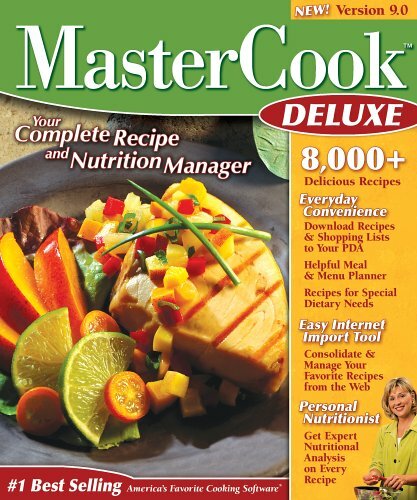 I have the MasterCook 9.0 so I can only review that, but I'm sure 11.0 is going to be awesome too! For more reviews you can visit its Amazon listing by clicking here! Hope you all enjoy!